Perranporth is a small, compact village, fronted by a glorious, three mile stretch of golden sand. This means that once you leave your accommodation or park the car, nothing is further than a few minutes stroll away! The beautifully manicured and sheltered Clock Gardens are at the end of the High Street (St Pirans Road) and just across the road you'll find Perranporths' pretty boating lake. This is a peaceful haven at the Southern end of the village and the perfect place for watching the world go by from a sunny bench. Another couple of minutes walk and you'll find yourself in Perranporth park, a beautiful grassy area nestled in the valley with tennis courts and a childrens play area. It's a glorious sun trap here if you want to avoid the brisk sea breeze and it's the perfect place to kick a ball around or lay your rug down for a picnic. Perranporth village has evolved around the beach and the golden sands are less than a couple of minutes from the High Street. The beach provides endless opportunities for leisurely walks with incredible scenery. For those wishing for something a little more challenging, the South West Coast Path is easily accessible within a few minutes walk from the village, arguably boasting some of the most spectacular ocean vistas in the world!? You may find that Perranporth can provide everything you wish for during your holiday. However, if you would like to spread your wings and venture a little further afield, it's also a perfect base to explore from. We hope that the following information may come in useful. There are regular buses servicing the neighbouring towns and villages Up to date information can be found on The First Kernow website. The bus route that services Perrnaporth is the 87'. If you're exploring by car, pop in and see us at the Tourist Information Centre for a free road map. We also stock local OS maps available for purchase. 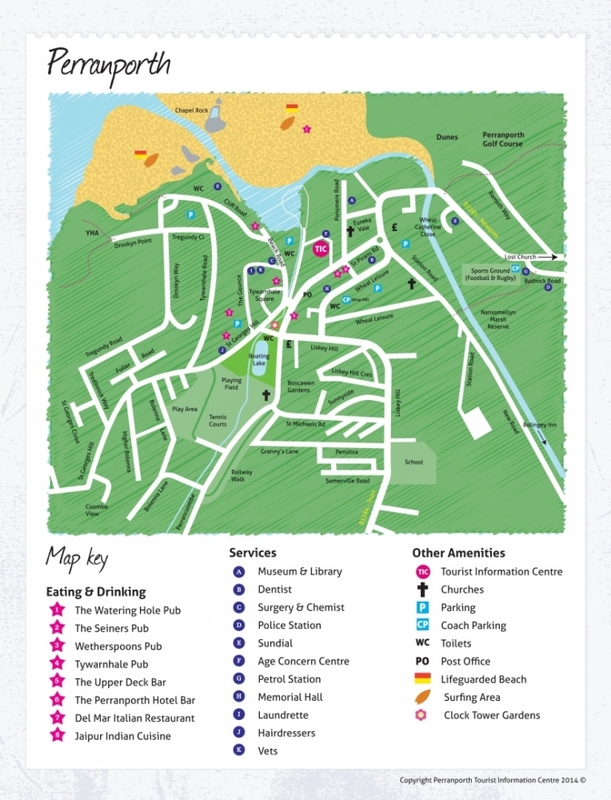 If you'd like to take a look at a map of Cornwall to help plan your stay, please visit our 'Where is Perranporth' page. Truro is the nearest main line train station, offering regular services to the different corners of Cornwall. There is also a direct train route from Truro to London. Up to date information can be viewed on the Trainline website. Perranporth has a handful of local taxi companies and their contact details can be viewed here.